Improve Leadership Skills with Toobeez' Unseen Obstacles. Homeland Security is a corporate team activity that help build teamwork. Build Forts, Castles, Bunkers, Playhouse’ & Critical Thinking Skills! Build Forts, Castles, Bunkers, Playhouse’ & Critical Thinking Skills! 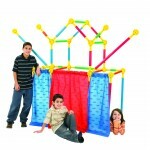 Build a Fort, Castle, Bunker, Playhouse, or Hideaway! EZ-Fort and TOOBEEZ are different products. There are no written activities for use with EZ-Fort.